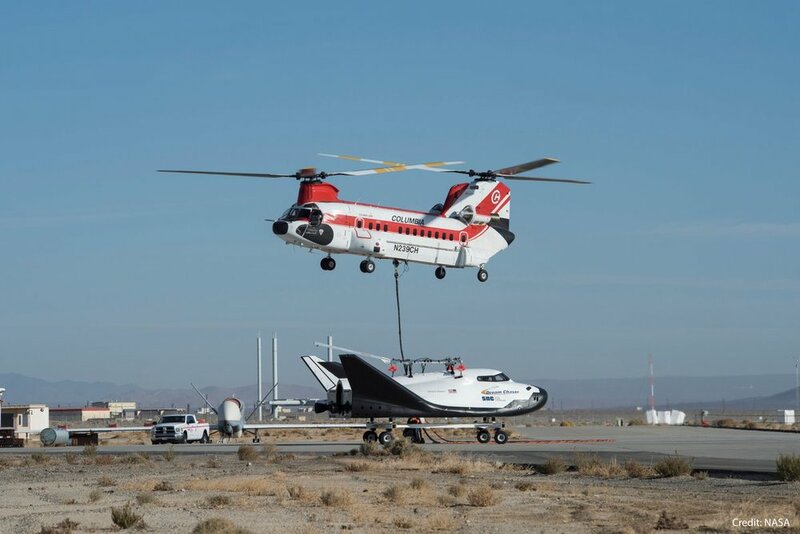 Sierra Nevada Corporation’s Dream Chaser spaceplane test article successfully performed a free-flight test at NASA’s Armstrong Flight Research Center in California. The spacecraft is being developed to send cargo to the International Space Station. The Nov. 11, 2017, automated test went as planned, according to an SNC statement. The flight occurred four years after the first glide test, which saw the otherwise perfect flight end with the craft flipping over upon landing when the left landing gear failed to deploy. According to NASA, the 2017 test verified and validated the performance of the Dream Chaser in the final moments of landing. The vehicle met expected models for a future return from the space station. “The Dream Chaser flight test demonstrated excellent performance of the spacecraft’s aerodynamic design and the data shows that we are firmly on the path for safe, reliable orbital flight,” Mark Sirangelo, corporate vice president of SNC’s Space System business area, said in a Nov. 13 press release. Dream Chaser was lifted by a helicopter and flown more than 3,000 meters in altitude before being dropped. It flew the same final approach and landing profile that it would have were it returning from the ISS. According to SNC, the test article included orbital vehicle avionics and flight software for the first time to provide orbital vehicle design validation. SNC brought Dream Chaser to the Armstrong Flight Research Center in January 2017 in preparation for the free-flight test. It has been occupying the same hangar that NASA’s Space Shuttle Enterprise used while it was undergoing Approach and Landing Tests in the late 1970s. The free-flight test came just over two months after the company performed a tow test on the vehicle on Aug. 29. This involved attaching Dream Chaser to a pickup truck that would pull it some 95 kph. Once up to speed, the spacecraft was released and its onboard systems slowed the vehicle to a stop. A day after the tow test, a captive carry test was performed. This was essentially a dry run for the glide test in order to gain data and calibrate instruments. Just like the free-flight test, Dream Chaser was suspended beneath a twin-rotor helicopter and flown through a number of maneuvers to gather information. This particular glide test was actually part of a space act agreement under NASA’s Commercial Crew Program when SNC was competing with Boeing’s CST-100 Starliner and SpaceX’s Crew Dragon to win a contract to send humans to the ISS. In a 2014 downselect from three providers to two, Dream Chaser was not chosen. However, in 2016, the space agency awarded SNC a contract under the Commercial Resupply Services 2 program. NASA said that the 2017 free-flight test helped prepare the spacecraft for service under the program in which Dream Chaser, along with SpaceX’s Dragon and Orbital ATK’s Cygnus cargo ships, will service the ISS through at least 2024. The latter two have been supplying the outpost since 2012 and 2014, respectively. SNC hopes to fly the first Dream Chaser to the ISS as early as 2020. Under the CRS-2 contract, SNC, as well as the other companies, would send at least six cargo missions to the outpost. The Dream Chaser Cargo System will launch atop an Atlas V rocket. It will sport an expandable cargo module at the rear that will feature solar panels and a docking mechanism. In total, the spacecraft is expected to be able to deliver more than 5,000 kilograms of pressurized and unpressurized cargo to the ISS.